I am so excited to share this Rainblow Loom birthday cake idea with you! If you have a kid at home who loves creating these bracelets, having a rainbow loom themed birthday party is such a fun and easy idea. This loom themed cupcake-cake is colorful, festive, and something you can make at home. This is an original idea that a friend of mine came up with and I think the results are fabulous! As you can see from the photo above, this loom birthday cake is actually made up of 18 cupcakes. First, make any type of cupcakes you want. The cupcakes shown above are made with rainbow chip cake mix which you can find in most grocery stores. Once the cupcakes have cooled, frost the cupcakes in white frosting. Then, place one marshmallow on top of each cupcake. 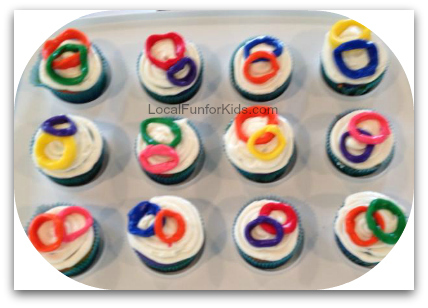 Use brightly colored fondant to make individual looms and wrap them around the cupcakes just like you were making a loom bracelet. I love how Wilton sells a pack of primary colored fondant which is perfect for beginner cake-makers. Using a rectangle flat sheet cake base will make the presentation look really nice and and help to keep the cupcakes in place. The cupcakes shown above were all made by my friend and her daughter. They wanted to come up with a unique rainbow loom cake idea, and I think they did an amazing job. The girls at the birthday party loved it! If you need more than 18 cupcakes, you can decorate the extra cupcakes like this. Just use the extra fondant to make 2 looms for each cupcake. I love the look of a rainbow themed birthday party. Don't you? If you want another cake idea for a rainbow party, check out this gorgeous Layered Rainbow Cake by Meaningful Mama.